Thomas De Quincey peels back the layers of the brain. What else than a natural and mighty palimpsest is the human brain? Such a palimpsest is my brain; such a palimpsest, oh reader, is yours. Everlasting layers of ideas, images, feelings, have fallen upon your brain softly as light. Each succession has seemed to bury all that went before. And yet, in reality, not one has been extinguished. And if, in the vellum palimpsest, lying among the other diplomata of human archives or libraries, there is anything fantastic or which moves to laughter, as oftentimes there is in the grotesque collisions of those successive themes, having no natural connection, which by pure accident have consecutively occupied the roll, yet, in our own heaven-created palimpsest, the deep memorial palimpsest of the brain, there are not and cannot be such incoherencies. The fleeting accidents of a man’s life, and its external shows, may indeed be irrelate and incongruous; but the organizing principles which fuse into harmony, and gather about fixed predetermined centers, whatever heterogeneous elements life may have accumulated from without, will not permit the grandeur of human unity greatly to be violated, or its ultimate repose to be troubled, in the retrospect from dying moments, or from other great convulsions. 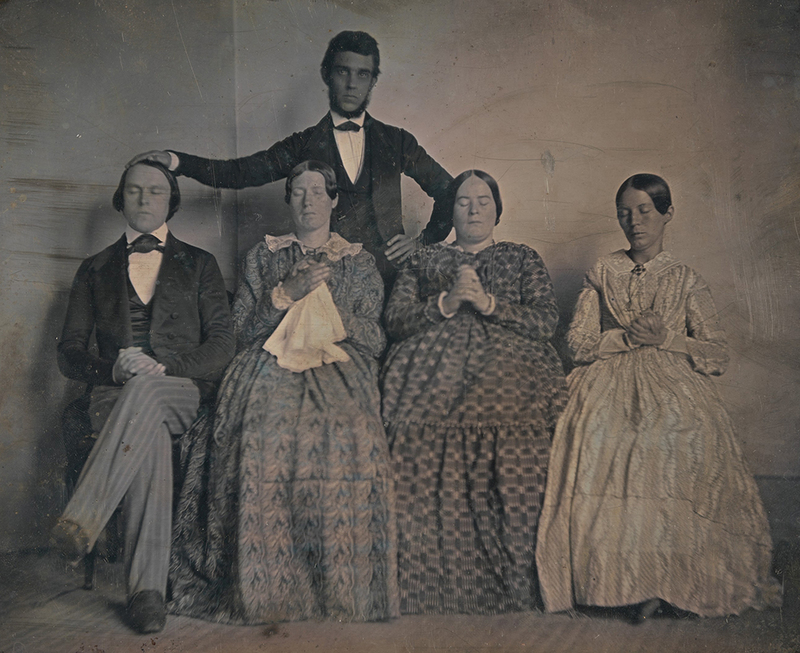 Hypnotist and his patients, c. 1845. Photograph by John Adams Whipple. © The Metropolitan Museum of Art, Gilman Collection, Gift of The Howard Gilman Foundation, 2005. Such a convulsion is the struggle of gradual suffocation, as in drowning. A case of that nature was once communicated to me by a lady from her own childish experience. The lady is still living, though now of unusually great age; and I may mention that among her faults, never was numbered any levity of principle, or carelessness of the most scrupulous veracity, but, on the contrary, such faults as arise from austerity, too harsh, perhaps, and gloomy, indulgent neither to others nor herself. And at the time of relating this incident, when already very old, she had become religious to asceticism. According to my present belief, she had completed her ninth year, when, playing by the side of a solitary brook, she fell into one of its deepest pools. Eventually, but after what lapse of time nobody ever knew, she was saved from death by a farmer, who, riding in some distant lane, had seen her rise to the surface, but not until she had descended within the abyss of death and looked into its secrets, as far, perhaps, as ever human eye can have looked that had permission to return. At a certain stage of this descent, a blow seemed to strike her, phosphoric radiance sprang forth from her eyeballs; and immediately a mighty theater expanded within her brain. In a moment, in the twinkling of an eye, every act, every design of her past life, lived again, arraying themselves not as a succession but as parts of a coexistence. Such a light fell on the whole path of her life backward into the shades of infancy, as the light, perhaps, which wrapped the destined apostle on his road to Damascus. Yet that light blinded for a season; but hers poured celestial vision on the brain, so that her consciousness became omnipresent at one moment to every feature in the infinite review. Imagination is the secret and marrow of civilization. It is the very eye of faith. This anecdote was treated skeptically at the time by some critics. But besides that it has since been confirmed by other experience essentially the same, reported by other parties in the same circumstances, who had never heard of each other, the true point for astonishment is not the simultaneity of arrangement under which the past events of life, though in fact successive, had formed their dread line of revelation. This was but a secondary phenomenon; the deeper lay in the resurrection itself, and the possibility of resurrection, for what had so long slept in the dust. A pall, deep as oblivion, had been thrown by life over every trace of these experiences; and yet suddenly, at a silent command, at the signal of a blazing rocket sent up from the brain, the pall draws up, and the whole depths of the theater are exposed. Here was the greater mystery. Now, this mystery is liable to no doubt, for it is repeated, and ten thousand times repeated, by opium, for those who are its martyrs. Yes, reader, countless are the mysterious handwritings of grief or joy which have inscribed themselves successively on the palimpsest of your brain; and like the annual leaves of aboriginal forests, or the undissolving snows on the Himalayas, or light falling on light, the endless strata have covered up each other in forgetfulness. But by the hour of death, by fever, by the searchings of opium, all these can revive in strength. They are not dead, but sleeping. From “The Palimpsest of the Human Brain.” De Quincey applied his idea of the mind as palimpsest—a parchment on which writing has been replaced but not expunged—to certain historical figures; Ralph Waldo Emerson, by his reckoning, was a palimpsest of Thomas Carlyle. First published in Blackwood’s Magazine, this essay became part of Suspiria de Profundis, a collection left unfinished at the time of his death in 1859 but intended as a sequel to his Confessions of an English Opium Eater.